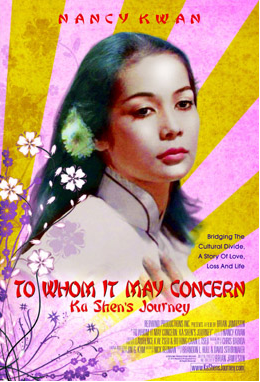 TO WHOM IT MAY CONCERN: KA SHEN’S JOURNEY is the definitive and true life story of NANCY KWAN, who as a young Eurasian girl from Hong Kong captured the hearts and minds of cinemagoers around the world in her stunning motion picture debut role in THE WORLD OF SUZIE WONG (1960), then in her unforgettable follow up role as “Linda Lo” in the all Asian, Rodgers & Hammerstein Hollywood hit musical FLOWER DRUM SONG (1961). With just two pictures in two years, the Eurasian girl from Hong Kong would become one of the most sought after young stars in Hollywood. But, the motion pictures that would follow would never again mirror, that initial success! This feature docu-drama explores the real life drama of “what happened” to such a promising career as it takes its audience on a personal journey, a woman’s journey, which is as equally compelling, as it is inspiring. Nancy Kwan’s story is both fairytale and poignant. It is a story of “Art imitating life and “Life imitating art” as the character she so aptly portrayed in THE WORLD OF SUZIE WONG, loses her only child in the story of the film. Sadly, in real life this same tragedy would occur, and her life would be forever changed by this circumstance. The film features JOAN CHEN, FRANCE NUYEN, VIVIAN WU and SANDRA ALLEN together with a host of family and friends of Nancy Kwan. It was extensively shot on various locations including Hong Kong, Cambodia, San Francisco, Los Angeles and Kansas City. Beautiful original watercolor artwork was created for the film by renowned Chinese American Artist Jin G. Kam. The poignant and original music score was composed by Chris Babida, the composer of the stunning Hong Kong Ballet score – Suzie Wong. Written, produced and directed by Brian Jamieson for Redwind Productions Inc.